I don’t know what it is ever since watching Paul Hollywood make crumpets from scratch on telly I’ve always wanted to give It a go. I had never realised to be honest that you could make them, believing they were some mythical, hot, carrier of butter concocted in a secret den in the North by Warburtons. However at a loose end one Saturday afternoon I decided to give them a crack. The recipe below is by Paul Hollywood and makes about 10 crumpets. It pretty much worked. Greasing the rings is important as they can be a pain to get out, especially as the rings are hot. Mine seemed to come out a bit too thick but still tasted great and had a nice light fluffy texture inside. I served mine with some hot buttered, Morecambe bay shrimps slaverred on top, but ‘The Flame’ had scrambled eggs on hers and loved them as well. Cooking time: 10 minutes each. If you have enough rings you could do about four at a time in a big frying pan. 1. 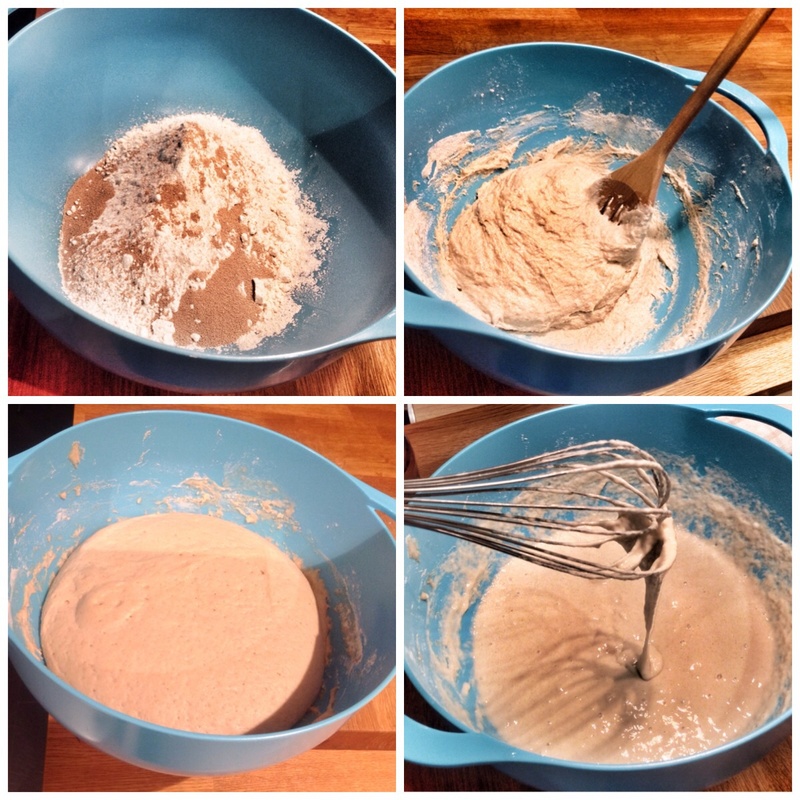 Put both flours into a large bowl and mix in the yeast. In a jug, dissolve the sugar in the warm milk, then pour onto the flour mixture. Using a wooden spoon, beat the mixture until you have a smooth batter. This will take three to four minutes and is hard work (he’s right here, it is hard work!) because the mixture is stiff, but it is essential to develop the protein strength in the batter and will ensure the crumpets develop their characteristic holes as they cook. 2. Cover the bowl with cling film or a tea towel and leave to stand for about an hour. The mixture will rise and then begin to fall – you will see marks on the side of the bowl where the batter reached before it dropped. This indicates that the yeast has created its carbon dioxide and is now exhausted. The gluten will now have developed sufficiently to give the crumpets structure and enable them to rise and hold their shape. 3. In a jug, mix 150 millilitres of the tepid water with the bicarbonate of soda and salt. Stir this liquid into the batter until evenly combined, then gradually stir in as much of the remaining water as you need to get a thick dropping consistency. Cover the bowl and leave the batter to rest for about 20 minutes. Little holes will appear on the surface and the batter will become a bit sticky. 4. Heat a flat griddle or heavy-based frying pan on a medium-low heat. Lightly but thoroughly grease the inside of at least four seven to eight centimeter metal crumpet rings (ideally non-stick). Lightly grease the griddle or pan, using a crumpled piece of kitchen paper dipped in oil. 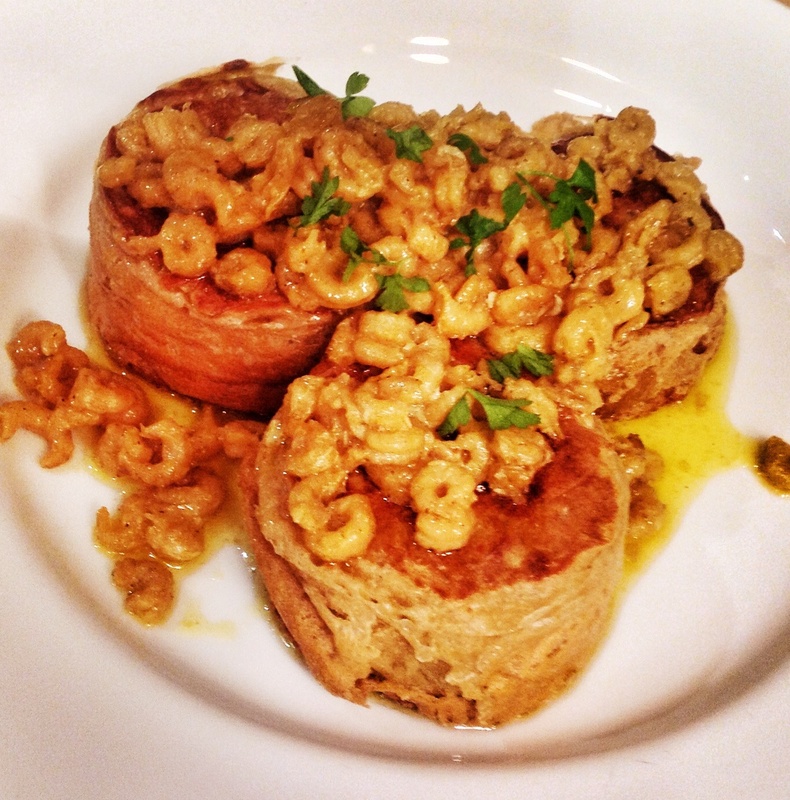 It’s a good idea to start with a trial crumpet. The first one is never the best, like the first pancake. 5. Put a greased crumpet ring on the griddle. Ladle enough batter into the ring to come just below the rim; it should be about three centimetres deep. 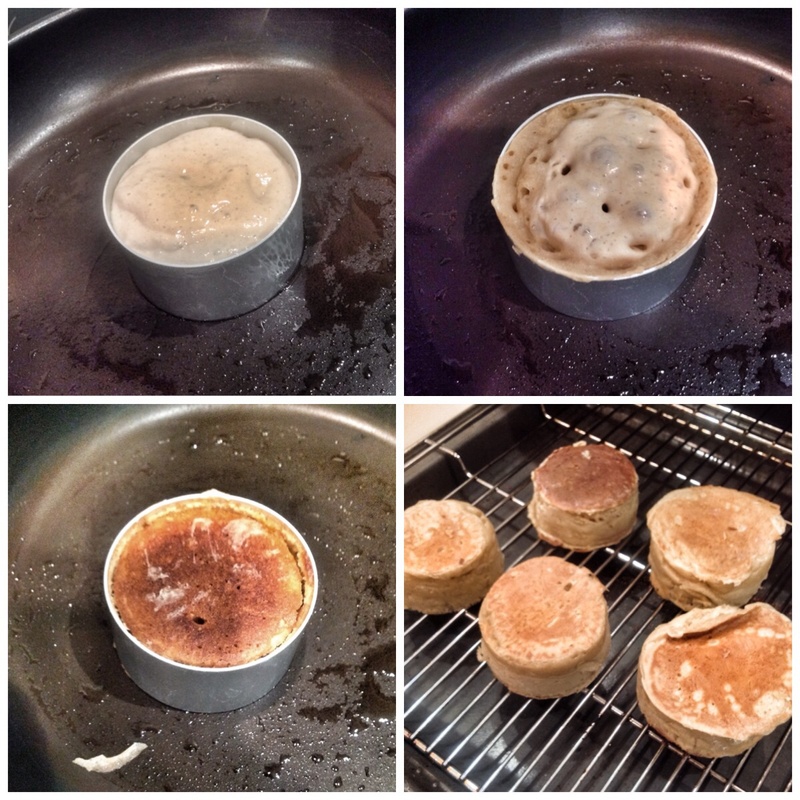 The temperature of the pan is important: it is better to cook the crumpet lower and slower than hot and fast. After six to eight minutes, the bottom of the crumpet should be browned and the rest almost cooked through. You’ll know when it is nearly ready once the top looks almost set and most of the bubbles that have formed on the surface have burst. You can slightly speed up the cooking by popping these bubbles as they appear, using the sharp tip of a knife. When the crumpet is ready, the bubbles will stay open rather than fill up with liquid batter. Turn the crumpet over carefully, using two kitchen tools, such as a spatula and a palette knife. Leave the crumpet to cook for another minute or two, then lift it off the griddle onto a wire rack. Remove the ring (if it sticks, run a small, sharp knife around the outside of the crumpet to loosen it). Now that you have fine-tuned the time and temperature needed for your batter, you are ready to cook the rest of the crumpets in batches. Serve the crumpets straight away, split or whole, with plenty of butter. Alternatively, leave them to cool on the wire rack and toast them before enjoying with butter. I’ve made them thinner since. Got the proper crumpet rings!